It’s a sobering thought (perhaps quite literally) that yesterday’s UK budget hike adding 15p in extra duty to a bottle of wine means that if we take the price of the average wine sold in the UK – around £4.47 – then tax and duty now accounts for 56% of that. That gives you something to consider when you think that the remaining £1.96 has got to cover the bottle, label, cork, packaging, transport, everyone in the supply chain’s profit and – oh yes – the wine in the bottle. As the duty is a fixed at £1.81, VAT is the only tax on every additional pound that you spend. So approximately 80p of each additional pound goes towards the wine, not the tax man. Worth trading up? 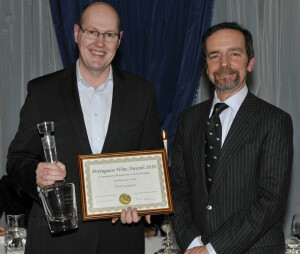 It does not seem like a year since Tom Cannavan was honoured by being names as Portugal’s 2010 journalist of the year (right, accepting the award from the Portuguese Ambassador). Tom will present his ’50 Great Portuguese Wines’ at tastings in London and Edinburgh in July. However time flys, and Tom was delighted to hand over the crown to Julia Harding MW, who takes over for 2011. She will now embark on her own quest to search for her 50 Great Portuguese Wines for 2012. With a fiercely fought battle for Portuguese National Retailer of the year, The Wine Society just pipped Majestic to the podium. Corks of Cotham and The Bottle Apostle were the winner and runner up of the independent retailer of the year award, and Eyre Bros (winners) and Ransome’s Dock (runners up) were both recognised in the Restaurant of the year category. Austrian wine has come over all social media with a big campaign on facebook and twitter, based around persuading bars, restaurants and hotels to serve Austrian wines by the glass, some of them offering special menus to accompany the wines. Austrian wine lovers can get in on the act too through the Austrian Wines website, where a competition is running to win a free trip for two to Austria and the Danube wine region. The competition prize includes free flights with Austrian Airlines from London Heathrow to Austria, accommodation in the historic town of Krems and a visit to a winery in Wachau wine region. The competition close at midnight on 30th April 2011. Sticking with Champagne, Taittinger will introduce its new ‘Taittinger Collection’ bottle to the UK market at the end of this month. Senegalese Amadou Sow is the latest artist to be commissioned by Taittinger to create a limited edition bottle, this time for the 2002 Vintage. His bottle is the twelfth in this ongoing series. The Taittinger Collection was the brainchild of Claude Taittinger who approached the Hungarian artist Victor Vasarely in 1983 with a view to commissioning the artist to make a distinctive look for a small number of vintage 1978 bottles. So successful was the execution, and so popular the concept, that Taittinger has continued to handpick artists to commemorate their special vintages. The new bottle will be available from late March and interested collectors should contact Champagne Taittinger’s UK agent Hatch Mansfield. With an RRP of £175 this unique Champagne will be available through selected wine merchants and retailers. 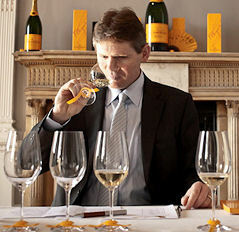 Research conducted by Wine Intelligence and a report entitled ‘How to reignite the wine offer in the UK.s pubs, bars and restaurants’ concludes that the number of regular wine consumers drinking wine in pubs, bars and restaurants is at an all-time high, now surpassing pre-recession levels. However, a significant proportion of these consumers are still finding the wine offer disappointing and difficult to navigate, according to the research. 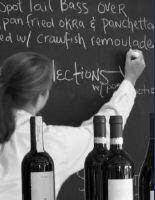 Pubs tend to be least effective at making wine attractive and relevant, principally due to the perceived poor quality of wine served, and lack of apparent focus on the wine offer in terms of point-of-sale materials. The report says it has ‘encouraging news’ however, that some simple guidance – easily understood wine lists, and the presence of some recognisable brands – is likely to change consumer behaviour. Respondents said they like seeing brands they can recognise. Indeed, the majority (55%) feel more positively about the wine offer if it has well known brands on it.